Millennials like to be marketed to in a non-intrusive and useful manner. They are naturally tech-savvy and are 2.5 times more likely to embrace new digital, social and mobile channels than their older counterparts, and appreciate it when technology is integrated into their customer experience. To stay ahead of competition, brands that aren't naturally technology adept (like companies such as Google, Apple, Twitter) should embrace technology in innovative ways that provide a useful interaction, seamless experience with their product or service, without highlighting technology as the main feature. A variety of brands have already embraced this successfactor. Below are a few examples of how brands have implemented technological aspects into their products/services in order to enhance the user experience. 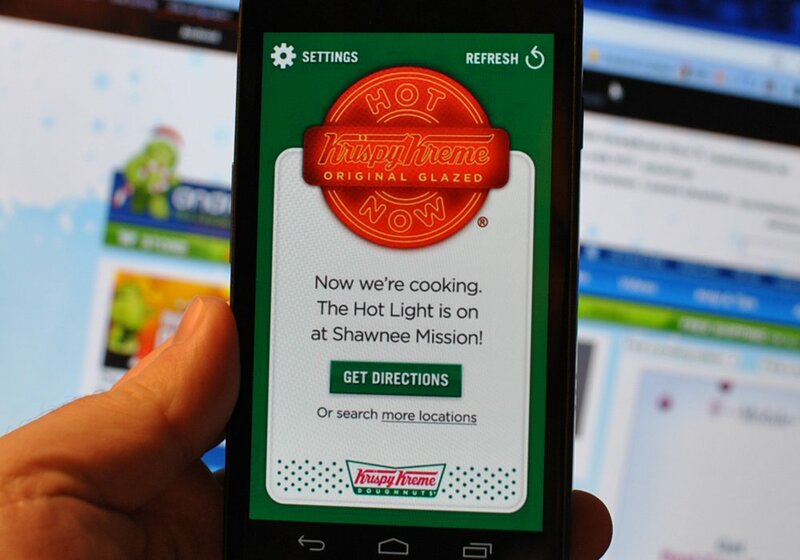 Krispy Kreme offers an app and online desktop widget that tells fans when the donuts are “hot off the line” and allows them to set a preferred location and provides directions to the nearest Krispy Kreme location. Oreo is among the brands rated most popular amongst Millennials. This is much due to their excellent and humoristic social media strategies, but also the ways in which they continuously strive to innovate and use technology to market their product. During the South by Southwest conference 2014 they displayed an Oreo milk bar featuring a 3D printer that would print edible trending cream flavors on Twitter to visitors in real time. Based on Twitter trends people would get a custom made Oreo cookie straight from a 3D printer. Pizza Hut has garnered a lot of attention after announcing a new concept table that may be introduced as an in-store experience. The concept is a tabletop screen in which customers can choose their pizza size, toppings and pay for their orders directly from the table in which they are sitting. Norwegian airlines have implemented a similar technology in the in flight screens in which travelers can order and pay for snacks and beverages directly from within their seat. Starbucks has an app that allows shoppers to pay for their beverages through their phones while in the store. They also have an online idea bank in which they encourage fans to contribute ideas for what the brand should introduce, proving that they are genuinely interested in what their consumers want. Part of their image is that they always offer free wifi at their locations. They are also in the process of incorporating iBeacon technology which will allow customers to pre-order coffee for pick up. In addition they have also been testing the use of virtual communities in which loyal customers can submit ideas and rate others ideas in an online environment. They are also asked to tip the company about in-store experience and community service-focused ideas. In exchange, participants are awarded points for sharing their ideas, receive positive posts about their ideas or commenting on or voting for someone else’s ideas. The top ten are recognized on the sites leaderboard each month. There have been more than 94000 new product ideas, 31 000 experience ideas and 20 000 involvement ideas posted. Participants can also track their own ideas progress, see them in action and see what reviews they get. This is a great example of a brand that not only encourages and listens to consumers, but is willing to take the extra significant step and risk of executing their ideas. Burberry has been in the forefront of embracing technology as part of their brand. 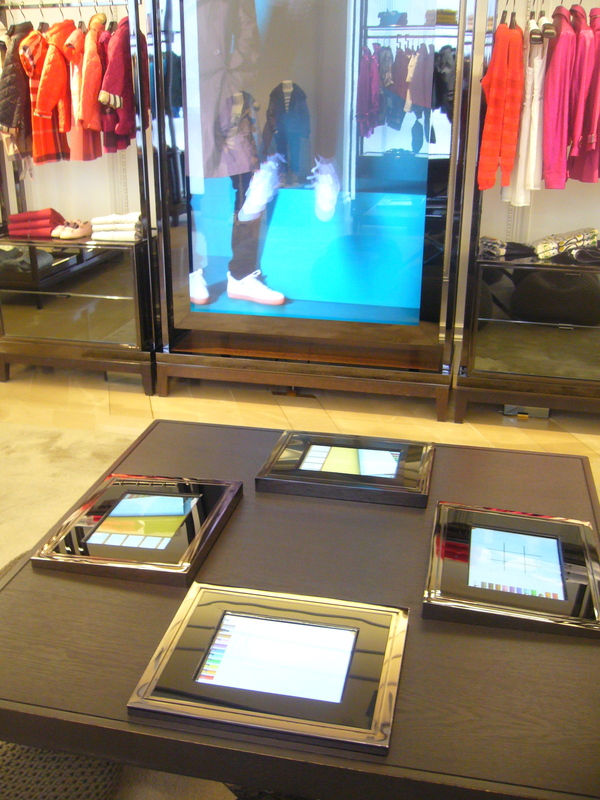 Not only did they feature an holographic fashion show Beijing in 2011, but they have also armed all of the in-store ambassadors with an iPad containing the ability to pull a customer’s purchasing preferences and habits instantly. Each item in the store contains a Radio Frequency Identification chip that interacts with mirrors to display relevant content on that product. British e-boutique Banana Flame uses augmented reality on their website allowing users to see what a dress might look like on the consumers body. By gesturing to the webcam, users can operate the virtual controls, adjusting the dresses position, color and size. When satisfied, they can take a photo and share it with their friends. Hugo-Boss features an 8 meter media wall in their store at Westfield Stratford City, the largest shopping center in Britain. 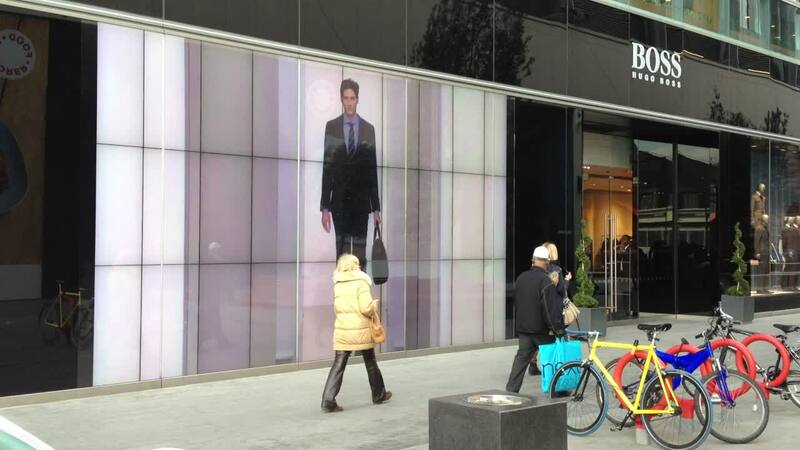 The media wall allows customers to “dress” onscreen models who respond to consumer’s movements by looking at them, moving towards them and walking alongside them. Top shop also launched an innovative campaign in collaboration with Google for the London Fashion week show, which you read more about here. Fashion Magazines including Tatler, InStyle and GQ have included AR codes in their print issues. When these codes are displayed in front of a webcam, a fashion film is superimposed on the magazine image. Ebay has a “see it on” app that enables shoppers to try on sunglasses using their iPhones camera. The clothing store Gap recently introduced a program that in addition to its “find-in-store” and “ship-from-store” options, allows consumers to order and reserve unavailable items while in store, an “instant access to expanded product offerings online” program which has resulted in 500,000 transactions so far. They are also in the process of introducing self-checkout and increased personalization of e-mail/website presentations. In Rome, the clothing chain also experimented with "whispering windows" to lure customers into the store which created a lot of media buzz. 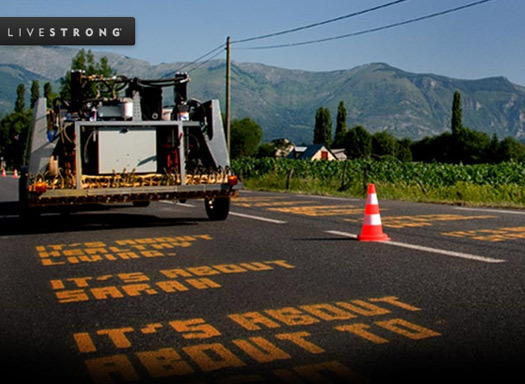 Nike introduced the Chalkbot as part of a campaign during the 2009 Tour de France. The chalkbot was essentially a robot writing in water soluble paint on the road offering inspiration to the competitors. The Chalkbot would take input from text messages and Twitter posts sent by the Public and print them in large yellow letters along the Tour de France course. Nike has also been in the forefront of technology advances, launching the Nike Fuel band in 2012, a wearable technology that tracks your daily movements and syncs with an app. The data is sharable across social networks and through Nike’s own app that allows users to track their activity and share it with friends. In 2010 Adidas introduced the Originals AR Game Pack, sneakers featuring an AR code on the tongue. When consumers held it up to a webcam, they would be navigated to interactive games online. 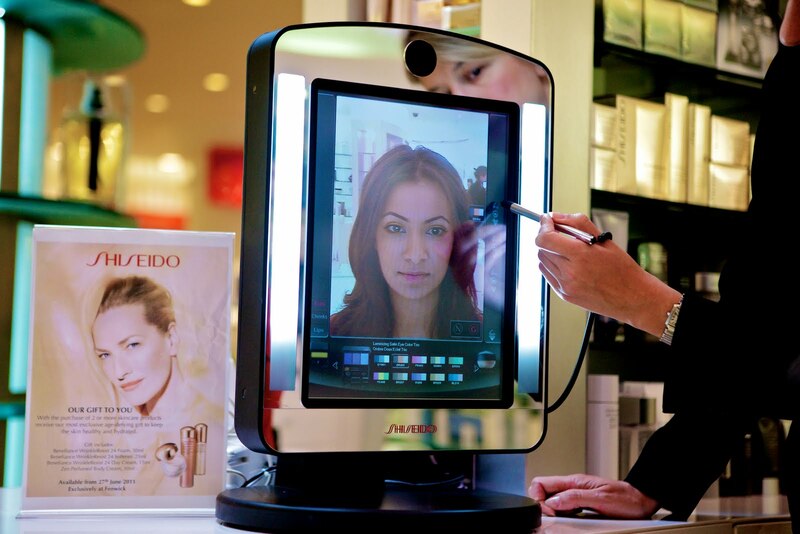 The make-up brand Shiseido introduced a magic mirror, featuring an augmented reality make-up simulator allowing shoppers to test products without being smeared with actuall makeup. 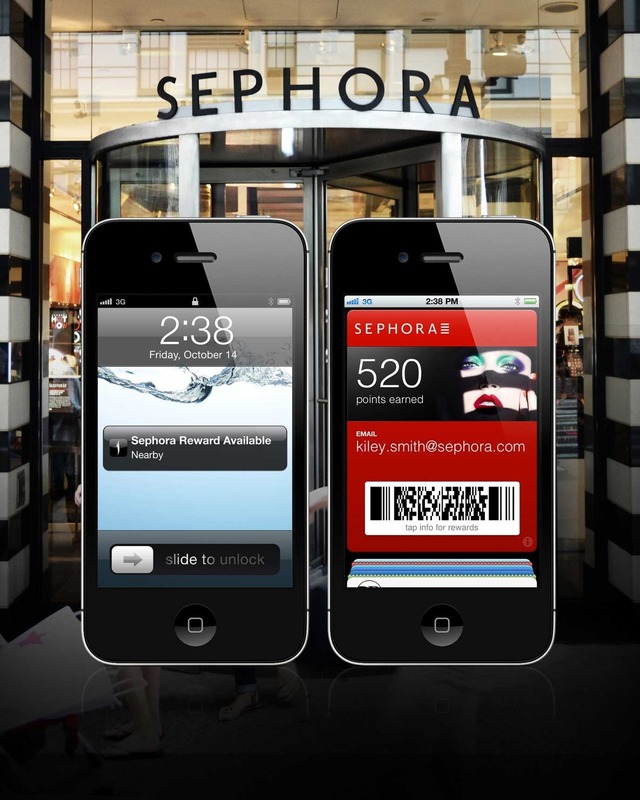 Sephora has been in the forefront of using technology to make their products and in-store experiences more exciting. They have equipped their stores with iPad touches, enabling mobile points of sale that allow busy young consumers to purchase right on the spot. Shoppers also get instant access to their purchase history or rewards program points. Sephora regularly sets up stands with neat ways of trying on make-up, testing fragrances and the like while in store and not physically testing a product. In addition they have tested a skincare IQ screen in which consumers answer a variety of questions and get personalized recommendations of Sephora's products in store. They were also one of the first companies to launch in Passbook, which allows shoppers to access their Beauty Insider card or store a Sephora eGift on their iPhones. Starwood Hotels and Resorts is extending their existing mobile apps to allow hotel guests to open their room doors using bluetooth powered phone and apps. All though though the technological innovations do not radically change the consumer’s experience or work flawlessly, each of the brands referenced are making strides to provide a more seamless purchasing experience by incorporating technology into their image. The fact that they are in the forefront of testing out the new possibilities also give the brands earned media and generate conversations about the creative initiatives on social media.